Feels like a little end-of-quarter window dressing as the SPUs are up 11 points on no real news. (No, a strong ISM Milwaukee report doesn’t count). Bonds are getting hit as well. The ISM Milwaukee report jumped from 48.6 in February to 56 in March. New Orders and production rose 19 points. Could this be a weather-related rebound? Perhaps. However, note that we are starting to see other data points (Kansas City Fed) showing that the Midwest may be waking up. Lots of important data this week, starting with the ISM and construction spending tomorrow. Then on Friday we get the jobs report. The Street is at 200k nonfarm payrolls, and an unemployment rate of 6.6%. Given the “six months” number thrown out by Janet Yellen, we could start to see the jobs reports begin to matter again for bonds, where a strong reports will be very bearish. Following on that theme, investors pulled $10.3 billion out of bond ETFs in March, the biggest liquidation since December 2010. If the economy is in fact picking up some steam, then the bond market is about to become a very treacherous place. Personal Income and Personal Spending rose .3% month over month in February. January’s spending number was revised down. The core personal consumption expenditure growth rate was 1.1% annualized, showing inflation remains tame and gives the Fed leeway to keep interest rates low. For all the talk about “six months” and “considerable time” don’t forget that this Fed takes the dual mandate seriously and believes inflation can be too low. If inflation remains around 1%, they will want to pursue policies to push it closer to 2%. The Fed has been trying to create inflation for six years and the numbers remain stubbornly low. Note that in response to recent data, Barclays has trimmed its estimate for Q1 GDP to 2% from 2.4%. The latest CoreLogic Market Pulse is out, with a couple of good articles. First, it discusses how housing affordability differs between first time homebuyers and buyers with an existing home. Affordability has been declining, but it has been declining more for first time homebuyers, which may partially explain why the first time homebuyer remains on the sidelines. Until they return to the market, we are going to have this sort of abnormal market, IMO. 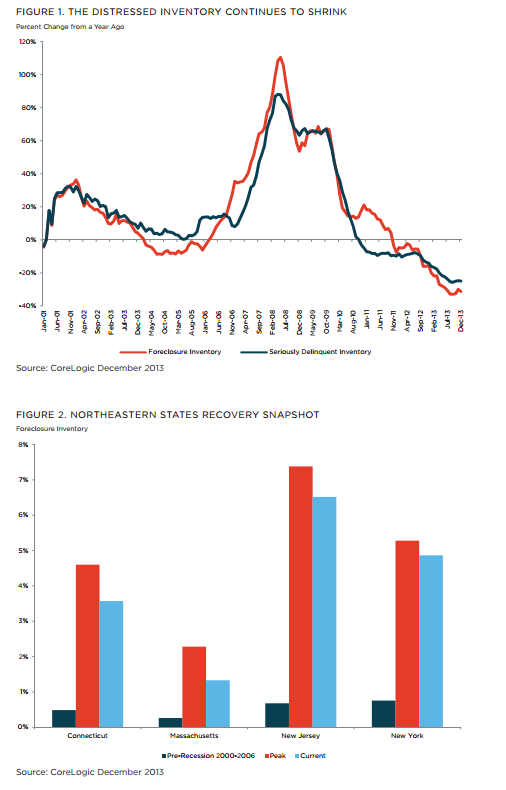 Foreclosure inventory is down 31% nationally from a year ago to about 837,000 homes. or about 2.1% of all homes with a mortgage. In states like California, professional investors snapped up the foreclosure inventory and at this point supply is constrained and prices are rising. Not so in the Northeast, where very little progress has been made on the foreclosure inventory, and unsurprisingly prices have barely budged. Markets are lower after yesterday’s sell off. Bonds and MBS are down small. Initial Jobless claims came in at 311k, lower than expected. The final revision to fourth quarter GDP is in – 2.6%. The advance estimate was +3.2%. Personal consumption was up 3.3%, which is a good number. The price index came in at 1.6%, which is still below the target level for the Fed. Mortgage banking profits hit a low in Q4. Average per-loan profits fell from $743 in Q3 to $150 in Q4, according to the MBA. This is the lowest level since the MBA began tracking this in 2008. Loan production expenses increased to $6.959 from $6,368 in the quarter. Loan production expenses are an “all-in” number that includes commissions, overhead, etc. Personnel expenses per loan averaged $4,385 in Q4 vs $4,130 in Q3. Average production volume was $367 million in Q4, down from $391 million in Q3. Secondary marketing income increased by 4 bps. Finally, the productivity rate was 2.0 loans per production employee per month, a decline from 2.5 loans in the third quarter. Lower volume + increased compliance costs = lower profits. And this is in Q4, before all the new rules kicked in. Is the distressed REO-to-rental trade getting played out? According to RealtyTrac, we have reached a state of stasis in the distressed real estate arena, with a dwindling supply of homes, institutional investors beginning to balk at the higher prices, a lack of supply of new construction, and an MIA first time homebuyer. All cash sales were 43% of all U.S. residential sales in February. The historical number is closer to 20%. There is an incredible amount of pent-up demand for the first time homebuyer once the economy recovers. That dip in household formation was due to a lousy economy, not fertility rates 25-30 years ago. Pending Home Sales dropped .8% month-over-month and 10.2% year-over-year. I’m sure weather played a role in this drop, but it confirms what RealtyTrac is saying above. Maxine Waters has proposed a bill to wind down the GSEs and replace it with a system that regulates the mortgage industry like a public utility, where a co-op of lenders would issue MBS guaranteed by the government. I wonder if that would also mean that the government would dictate how much a lender is permitted to make on a loan. She would reduce the private sector’s first loss risk to 5% from 10%, and lower the required down payment to 5% (3.5% for first time homebuyers). Naturally, this is a bill the left is going to love because it ensure that “underserved” constituencies continue to be subsidized by other borrowers. This bill has a less than zero chance of ever becoming law, so it is basically just a political marker and nothing more. Markets are higher this morning in spite of a kind of weak durable goods number. The headline number was better than expectations, but once you strip out air and defense, they actually fell. The market seems to be handing out weather-related “get out of jail free” cards like candy these days. Bonds and MBS are flattish. Mortgage Applications fell 3.5% last week. Purchases rose 2.8% while refis fell 7.7%. Rates rose 6 basis points which explains the drop. Refis dropped to 53.8% of all loans. The buy and mod business remains robust, at least in NY, one of the most lender-unfriendly states out there. DQs loans in Northeast judicial states like NY and NJ trade for 60% of BPO, as opposed to California, where it is closer to 80%. Maybe this is what it takes to move the logjam of foreclosed properties in New York. Party like its 1999: Candy Crush is worth $7 billion. Guess all of those annoying facebook push ads must be worth something. Redwood just priced $180 million of top rated jumbo securities paying 4% at 101.30. The REIT had been simply selling loans outright to banks lately given their appetite. US futures are following European markets higher. Bonds and MBS are down. Some economic data this morning: New home sales fell 3.3% in Feb to an annualized 440k. Consumer Confidence increased from 78.3 to 82.3, while the Richmond Fed Manufacturing Index fell a point to -7. I suspect weather played a role in the new home sales and Richmond Fed numbers. The FHFA house Price Index rose .5% in January, a little lower than expected. Case-Shiller rose 13.24% YOY, slightly below expectations. The Black Knight (formerly known as Lender Processing Services) home price index was flat in Jan, but up 8% year over year. 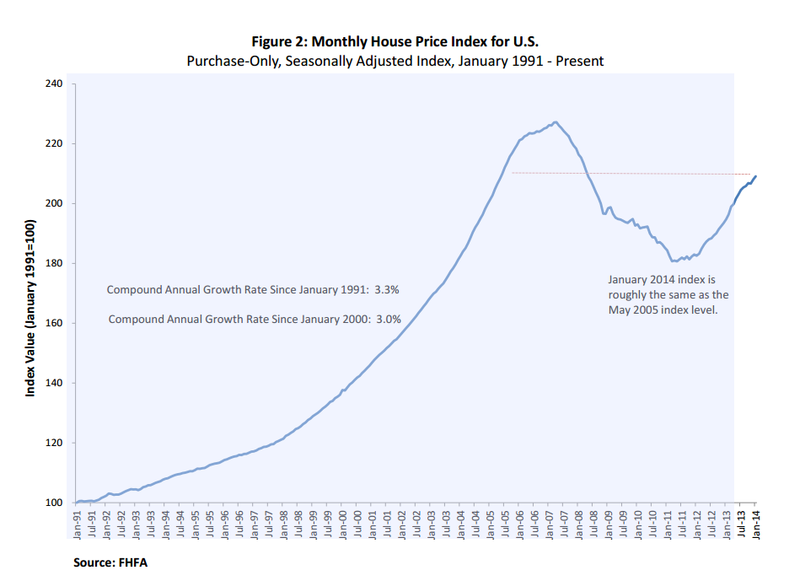 They have home prices within 14% of the June 2006 peak. Note that in the Black Knight survey, the Northeastern states (NY, NJ) are starting to wake up. Charles Plosser was surprised by the market’s reaction to the FOMC statement. Punchline: We should be talking about economic conditions, not timelines. FWIW, I was surprised as well. 6 months after the end of tapering (which will presumably happen at the Dec FOMC meeting) puts you at the June FOMC meeting. Since most forecasts have the Fed funds rate increasing sometime in 2015, an early forecast of a June 15 hike doesn’t seem all that surprising. A lot can happen in 15 months. Plosser would like to see the Fed Funds rate over 2% for 2015 and over 3% for 2016. Markets are higher this morning after some good manufacturing data out of Europe and the US. Bonds and MBS are down. The Chicago Fed National Activity Index rebounded in February to a better-than-expected.14 after a downward-revised -.45 in January. The Markit US Manufacturing PMI came in light. We have quite a bit of data this week, with the FHFA Home Price Index, Case-Shiller, and new home sales. On Wed, we get durable goods, Thursday, we get GDP and Personal Income / Spending. Small cap stocks are back to bubble valuations.